Dr. Rea was born and raised on the west coast of British Columbia. He earned his Bachelors of Science and Dental degree at the University of British Columbia. He practiced general dentistry for 3 years prior to entering his hospital based residency training at the University of Washington in Seattle. 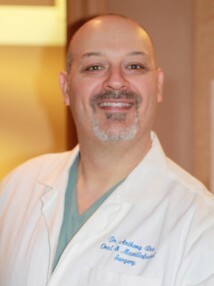 After receiving his certification in oral and maxillofacial surgery from the University of Washington in 2005, Dr. Rea established a full scope oral and maxillofacial surgery practice in Victoria. He is currently the Division Head of Oral and Maxillofacial Surgery for Island Health and South Island. He maintains a hospital base and private practice with a 10-year affiliation at the Victoria General and Royal Jubilee hospitals. His experience in corrective jaw surgery and jaw reconstruction following congenital and post-traumatic deformity has made him a leader in the community. He is currently the president of the British Columbia Association of Oral & Maxillofacial Surgeons. He is a fellow of the Royal College of Dentists of Canada, a fellow of the College of Dental Surgeons of British Columbia, and certified specialist in oral and maxillofacial surgery. Book your first consultation with West Coast Oral & Maxillofacial Surgery. We look forward to meeting you.